No doubt in a basement office in Cleveland or the back booth of a coffee shop in Pittsburgh or on an iPad in the middle of study hall in an Indianapolis high school, there’s an aspiring screenwriter punching keys and imagining great adventures that she hopes will someday grace the silver screen. Not in Los Angeles, not in New York, but right here in the Midwest. Is she just chasing a dream? Not according to screenwriter Pen Densham, whose film credits include Robin Hood: Prince of Thieves and Backdraft. 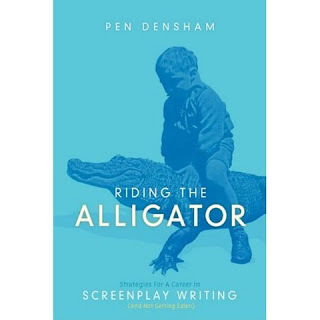 Densham recently published the book Riding the Alligator, his definitive guide to screenwriting that advises writers to filter their final product through their passion. We had a chance to chat with Densham via email to get his take on screenwriting outside of Hollywood. Midwest Movie Maker (MMM): Pen, what simple advice would you give an aspiring film writer living in Toledo or Erie or Lexington? Pen Densham (PD): The most important information that I can share with artists, no matter where they live, is do not try and chase the market, but write from your own passions and instincts. No matter what city you live in, your voice as an artist is the key to your success. Movies are frequently made because they have a fresh point of view or are emotionally valuable, and the creator of the movie does not give up on themselves. They keep fighting to get them made because they have faith in what they have created. The danger in copying what you've seen when trying to chase a trend is you are probably doing that with thousands of other writers. The studios and producers are probably already switching to new goals. And if you did not have a personal investment in the reasons you wanted to create the story, when you run into obstacles you will probably give up. MMM: Maybe there are writers who have an idea for a film, but have never studied the craft of screenwriting. How do they get started? And can they get started anywhere? PD: I left school at age 15. I learned screenwriting in the trenches and founded a company that has grossed over $1 billion with its TV series and feature films. I firmly believe I succeeded because I did things in the way that my natural creativity best worked. When I was asked to teach the MFA class at the University of Southern California on creating and selling feature stories, I reviewed all the major books on screenwriting and decided that there was not a one-stop book that existed that would have helped me when I was starting out. So I decided to try and fill that need. Riding The Alligator is designed to inspire writers to discover their true artistry. It aims to help them survive in a unique and sometimes challenging business. My first rule is that your creativity is sacred and you should ignore anything I espouse if it goes against the nature that helps you to write. It was written sharing each chapter with my students. I am probably one of the few professors that had his papers graded by his own class! MMM: What two or three skills MUST a screenwriter possess to make in the business? PD: Passion and productivity are musts! It is easy to get depressed and not turn out your work, but strangely we frequently self-criticize ourselves into oblivion when the material is actually better than what our internal critic allows us to believe. Writing from passion has proven to me a unique discovery: the films that I wrote for the studios have gotten made far fewer times than the projects I wrote for myself - the ones that my instincts said that I had to write. I often felt I was stealing time from my company to get them written, but I think they have gotten made more often because they are more original, more artistic, and more satisfying to me. MMM: Hollywood beckons for a lot of aspiring screenwriters. At what point should a writer take the leap and move west? Is there a point where a screenwriter "knows" they've honed their skills enough to take a shot in L.A.? PD: There's no right answer to the question of whether you should move to Hollywood to try to accommodate your career goals. In order to understand an ecosystem, it is better to live in the environment than study it from a distance. But - I know a number of writers who have kept their lives and thus their perspectives more finely tuned by staying in their home states and selling to Hollywood. They have managed to get movies made and have sustained a career. There is actually something in human nature that hears when someone is visiting just for a few days that might trigger a meeting with a potential buyer, that living in the town doesn't so easily accomplish. And Hollywood is obviously not the only market. Films are developed by individuals who live all around the world. DeNiro develops out of New York. There is a healthy production business in Canada, England and Australia. Plus there are companies setting up businesses in U.S. states like Louisiana to take advantage of producing with generous tax breaks. The one thing that Hollywood offers is a center of information which a writer can access through an agency or a well-informed Los Angeles manager. And that really is your starting point: can you produce material that these people believe they can sell, and will you come in for the occasional meeting because human face-to-face contact is a necessary part of almost all business and creative interactions? Maybe you can Skype from then on in. MMM: Ohio recently created a motion picture tax credit, which has lured a number of films to the state in the last 12 months, including Denzel Washington's "Unstoppable," George Clooney's "The Ides of March" and the upcoming "Avengers" film. Does this rise in production translate to screenwriting opportunity for Midwesterners? PD: Living in a state where there are tax breaks is an advantage. There is a strong chance that film production houses will set up business in order to navigate the tax complexities and these companies may well be more friendly to local creators. I know several people who started their careers because they made genuine efforts to reach out to visiting filmmakers and struck up long term productive relationships. A key to all of these businesses is that one must not only create but must make an effort to communicate. An authentic caring approach where you have researched and genuinely value the accomplishments of the people who you want to link up with, are going to get received better than bland, almost spam-like email inquiries. You have to put your heart on the page and let the artist you are trying to communicate with know that you know their work, value their work and what you are hoping to approach them with is something that would be an extension of their creativity and not a replica of what they have just done. I ask my students to read books like How to Win Friends and Influence People. Human contact is a major part of effectively seeing your dreams accomplished.